Eucharistic Adoration in our church takes place every Friday from 9.00 am just before the 10.00 am Mass. We also hold a Vigil on the first Friday of every month from 6.00 pm to 10.00 pm. Usually during the Vigil there is Adoration of the Blessed Sacrament, Celebration of the Holy Eucharist and an opportunity to receive the Sacrament of Reconciliation. 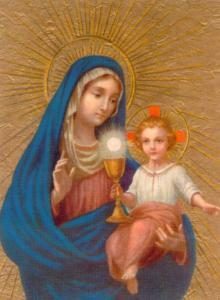 From Wednesday 7th November 2018, additional Eucharistic Adoration has taken place every Wednesday, from 2.00 pm to 10.00 pm. Many members of our congregation have already committed to spending one hour during those times with the Blessed Sacrament. However, we would welcome many more people to share this wonderful experience with us every week. We would like to invite you to the AGM of the Adoration Team, which will be held in the Parish Hall on 12 May 2019 at 12.30 pm, as part of the Parish AGM. We hope you will be able to attend the AGM because, as a regular Adorer, we would like to hear how Adoration is working for you and any ideas you may have about it. You will also, if you wish, have the opportunity to become more involved as part of the Adoration Team. Please let us know if you will be attending by emailing that information to Lmp2409@outlook.com. Thank you. There will be NO Adoration during periods of snow and ice when road conditions are too dangerous to walk or travel. Eucharistic Adoration is open to all so you don’t have to sign up for the hour every week, but can drop in when you are able. You don’t even have to stay for an hour. Come when you can and stay for as long as you can to share the love of Jesus. We have to make sure that we have enough people in attendance so the Blessed Sacrament is never left alone. To achieve this, a schedule of Adorers is displayed on the noticeboard in the porch at the entrance to the church and if you decide, in the future, that you can commit to an hour, we would be very pleased to hear from you. Just contact Lynne Pearson, the Chair of the Apostolate Team on 07952 744679 so that a time of your choice can be allocated to you or you could be asked to ‘cover’ a particular period of the day when there may be too few people in attendance. Take this opportunity, if you can, to come and bathe in the light of the Lord, sharing your thoughts and feelings with Him and becoming transformed by His love. If you can’t attend any of the sessions, you can pray that they are successful by offering up your prayers in communion with the members of the parish who are able to attend or you could consider becoming an “Emergency Adorer” which means that you agree to be contacted in exceptional circumstances when scheduled Adorers may not be able to attend. Please download the Guidelines for Adorers for more information. Thank you and God blessings.